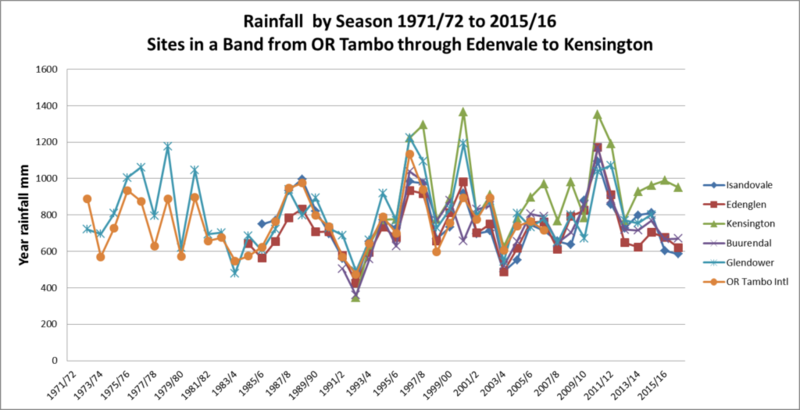 Rainfall at six sites local from 1971/72 to 2015/16 roughly follows the 11 year pattern (first graph below). 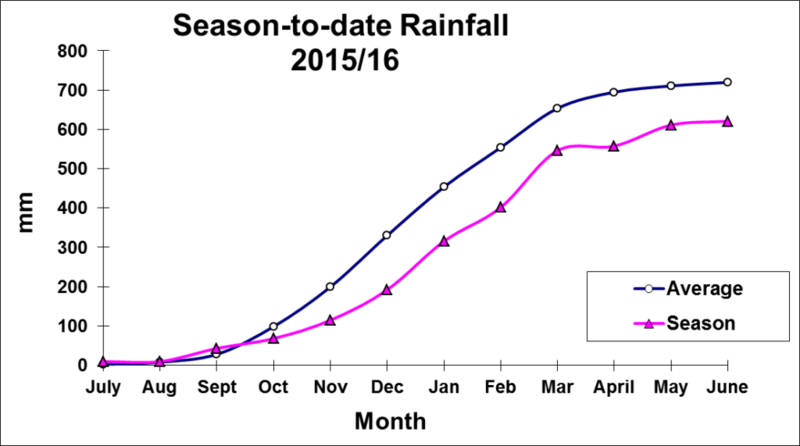 This places us now at the end of a dry phase, and peak of the next wet phase will be around 2020. 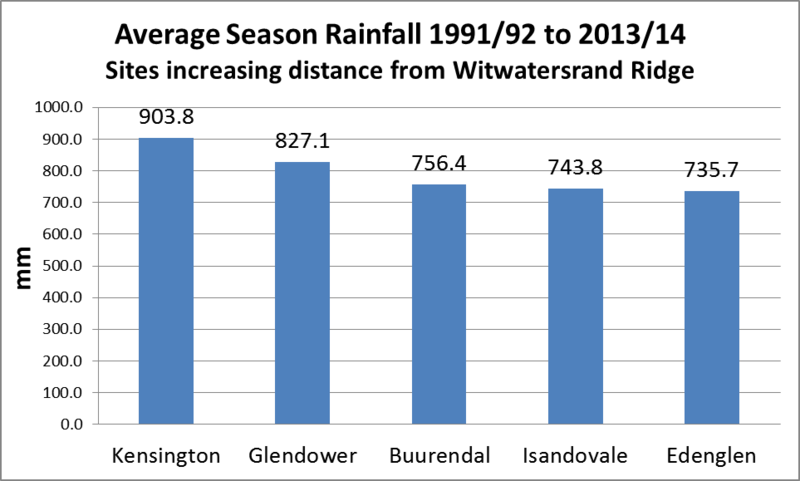 The first figure below shows the positions of the six rainfall sites in relation to the Witwatersrand ridge, looking north. 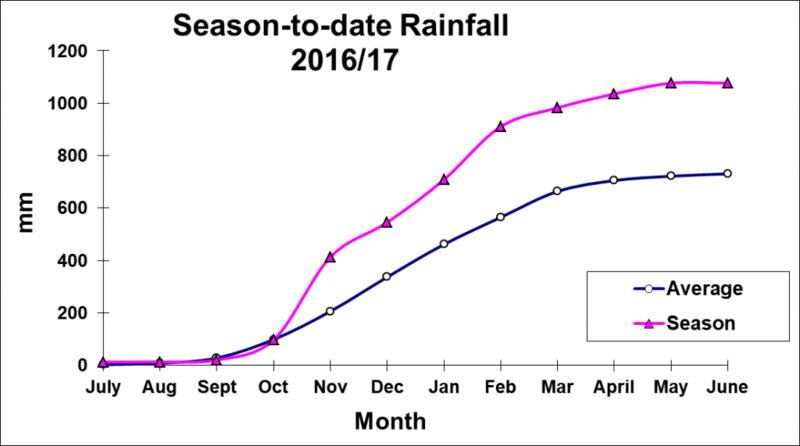 The graph that follows shows the average seasonal rainfall for the 23 year period from 1991/92 to 2013/14 that are common to five sites. 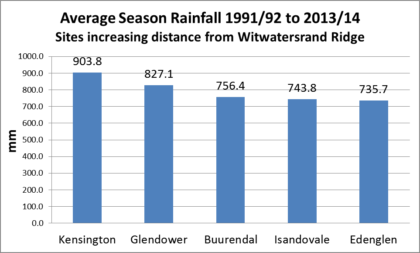 Rainfall declines as one moves west to east. This could be due to the influence of the city to the west, or the ridge since the there are two ridges to the west and they are higher. 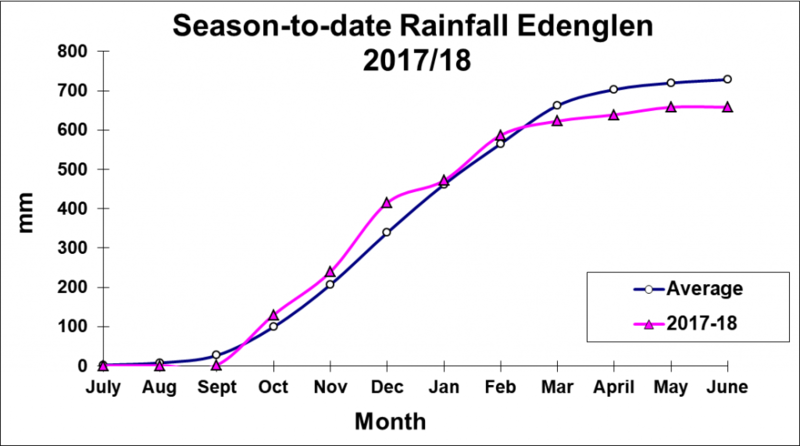 Compared to Kensington which is on the ridge, rainfall is 8% lower in Glendower and 19% lower in Edenglen. The five sites are in approximate order of distance from the ridge. 1983 . . . . . . 9.0 7.0 18.5 73.3 133.5 206.5 . . The Department of Water and Sanitation maintains hydrological stations on major rivers that measure the volumes and levels of flow. There is only one station on the Jukskei that is still functioning and that is Nietgedacht A2H023. This station has continuous monthly peak flows and levels for 50 years. 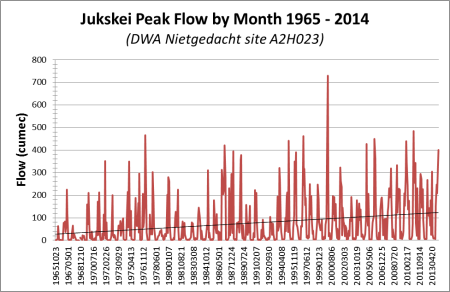 The trend is to higher peak flows (see below). Statistical modelling of the data shows the peak flows have risen 10-fold over 50 years andwill increase 30% in the five years to 2020. This is roughly when the next wet phase will peak.